Five Shrewsbury students participate in a video tribute for the victims of the Newtown massacre. It was the idea of his friend Ben Proulx, a director/producer, Cohen said, to take the project a step further and create a video of the song featuring a children&apos;s chorus. That idea then turned into another – use the video as a way to raise funds for a memorial park in Newtown.? And over the course of just a few days, the project became a reality, garnering praise from many, including family members of the victims. 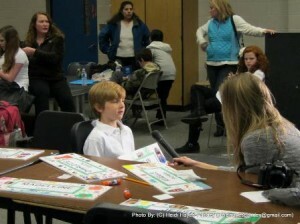 Sam Thomann is interviewed about the child he researched. One of the team members, Becki Dennis, the founder and owner of Talent Tools, helped to cast the video. An online search led her to Shrewsbury resident Natasha Colonero&apos;s Facebook page, New England Kids Actors Group. 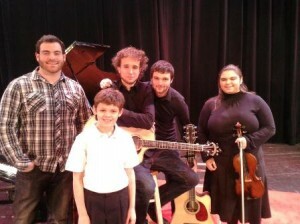 Matt Thomann stands with Cohen and the musicians who performed on the video. Twenty children from across the state, including five from Shrewsbury, took part in the video. 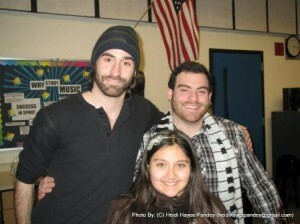 Besides the Colonero boys, Shrewsbury students Syra Pandey, 10, Matthew Thomann, 10, and Samuel Thomann, 8, were cast. Five musicians accompanied Cohen as well. 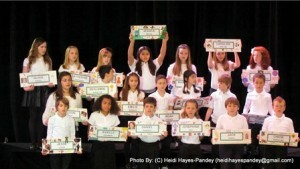 Each child was first assigned the name of one of the Newtown victims. They researched and then created cards that noted the name and pertinent facts about that person. During the video, the cards were raised one by one and then all together at the end. Syra Pandey with Justin Cohen. devoted to the project,” Dennis said. After Dante was assigned Jesse Lewis&apos;s name, Natasha was actually able to get in touch with Jesse&apos;s mother, Scarlett. Cohen said he too had heard from Scarlett and one of Jesse&apos;s uncles. Natasha Colonero helps her boys Dante (l) and Gianni (r ) decorate their signs. The song was first recorded under the direction of Connor Hayes and Justin Friedberg, of Project 2 Studio in Manchester, N.H. The video was then shot at the Collins Center for the Performing Arts at Andover High School. Everyone involved in the project donated their time and talents, Dennis noted. The goal, the team said, is to help raise funds for efforts to create a memorial park in Newtown. In such a park, they hope to place an “Angel of Hope” statue where families and other people may go to quietly reflect and remember those who were taken too soon. Similar statues, based on one in the book, “The Christmas Angel” by author Richard Paul Evans, have been placed in other parts of the country.